Laser-etched weaving draft (Brigid's Cross) pattern with embedded QR code pattern, on Plexiglas, constructed into cubic 'reliquary' with the assistance of Alexandra Lemus Rodriguez and Antoliano Nieto, mock ossified form (Mock Ossification II) in gel wax secured inside. Abandoned on empty sculpture base in front of the Musée des beaux arts, Montreal, QC. Tracked online via handmade GPS tracker for approx. 20 hours after abandonment (entire duration of battery life of the tracker). Handmade GPS tracker construction and online tracking setup with the assistance of Michael Mersereau. Never found or reported, object still missing, potentially (according to tracking information) in the possession of the Musée des beaux arts, Montreal. 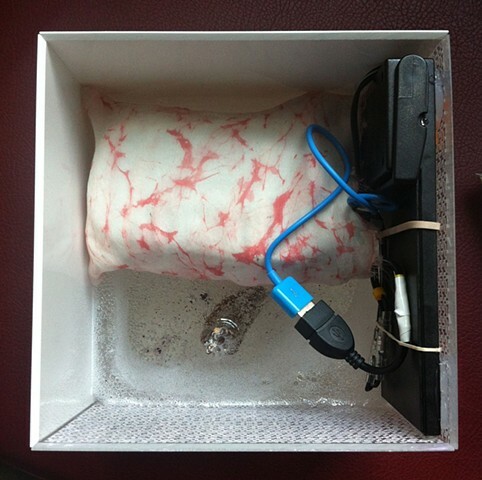 *Main body of GPS tracking unit is disguised in handmade bag of hand-dyed silk and velvet, with solar panel and battery pack.